In today’s world of specialization, it is vital to remember those geniuses who have been masters in many fields—the great talents not limited to one form of artistic expression. Michelangelo was a painter, sculptor, architect, poet, and engineer. Goethe, one of the greatest men of letters, was also an accomplished horseman, swimmer and skater. He loved to dance and act and was an amateur cellist. There was no discipline or activity alien to him, from archaeology to zoology. His works span the fields of poetry, drama, literature, theology, philosophy, humanism and science. Leonardo da Vinci was a polymath, scientist, mathematician, engineer, inventor, anatomist, painter, sculptor, architect, botanist, musician and writer. Salvador Dalí, whose expansive artistic repertoire includes film, sculpture and photography, was not only a great painter, but also a skilled draftsman and an interesting writer. Pablo Picasso was a painter, draughtsman and sculptor. India has also produced quite a few multitalented geniuses. Talents like Satyajit Ray and Rabindranath Tagore can never be forgotten. Ray was an excellent filmmaker, a fiction writer, publisher, illustrator, graphic designer and film critic. Tagore, a man with a multidimensional personality, was an outstanding poet, painter, prose-writer, composer and politician. These creative men had so much to give to the world. Imagine a man bed-ridden due to sickness and yet writing fine pieces of prose and poetry. That is exactly what Tagore did in the last few months of his life. His pen remained active till the very end. Four new volumes were published in his last days, which included three of poems entitled Navajatak(The New-born), Sanai (The Flute) and Rogasajyay(From Sick-bed) and one of prose entitledChhelebela (Boyhood Days). How little I know of this mighty world! Have remained beyond my awareness. And small the corner where my mind dwells. The right to everlasting peace. Tagore was a prolific genius. He wrote about fifty plays, a hundred books of verse, many of which he set to music, and forty volumes of novels, short stories and essays. Later, he painted portraits with warm, sweeping brushstrokes. 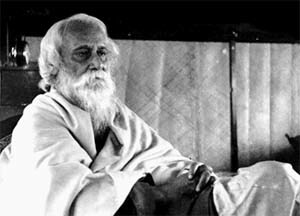 What was the secret of Tagore’s creativity? Where did this “creative vitality” spring from? D.T. Suzuki’s interpretation of Zen may help us in finding answers to these questions. From this interpretation we learn that Nature is spontaneous and creative, and that man being a part of Nature, acts best when he acts with freedom. He hated school education: “What tortured me in my school days was the fact that the school had not the completeness of the world. It was a special arrangement for giving lessons. It could only be suitable for grown-up people who were conscious of the special need of such places and therefore ready to accept their teaching at the cost of dissociation from life. And so Tagore’s guardians gave up all hopes about his career and even ceased to scold him. His eldest sister lamented, “We had all hoped Rabi would grow up to be a man, but he has disappointed us the worst.” Certainly, by all academic standards Tagore had proved himself a drop-out. School education disgusted him so much that all his life he continued to joke about his lack of academic qualifications, which his countrymen treasured, for such qualification was almost the only passport for government service under the British rule. In a letter written to his granddaughter, Nandita, who had shortly before left for Europe, he sent her his blessings and good wishes and included among them a hope that she would fail in the University Entrance examination, which she had taken shortly before, for how would he show his face to the world if his grandchild succeeded where he had failed. Tagore is one of the few men who really “mastered true understanding.” He was something more than a poet, a writer and a painter. He was an artist in life. His verses were a reflection of his inner self. His personal life was as clean and noble as his works. Writing for him was an act of faith, nor a trick of grammar. What he was, determined his style. He wrote not for pleasure or profit but out of joy, conscious that his genius was a gift from the divine, to be used in the service of man. Rajesh Williams is a professional editor and a writer with a background in instructional design, technical writing, technical editing, teaching, white paper writing, and development of marketing brochures, flyers, and data sheets.